A project created to raise awareness of our territory and to share its colors and emotions. 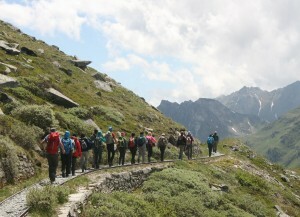 with hiking – naturalistic guide to choose from three scheduled weekly. 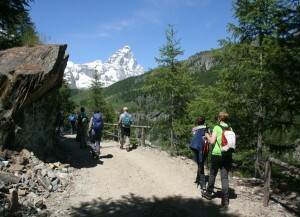 Thirty kilometres in the shadow of the Matterhorn between views and landscapes of rare beauty of the Breuil basin. From the Oriondé Refugeat, an altitude of 2808 metres, the glance dominates the valley. An itinerary of ancient paths that winds around is a circular routethe Motta di Plété. Crossing gorges of rare beauty you reach its vasta and flat summit. 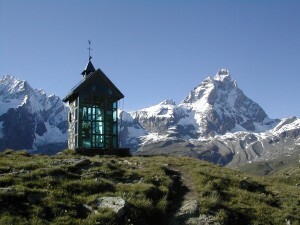 In the pastures of Tramal Dameun stands a chapel in crystal and metal. Though equipped with a micro-bell tower it is too small to contain the faithful, nor does it want to: it is simple transparency, a symbolic reference which lifts the glance well above the Gran Becca. This fascinating itinerary winds through Valtournenche taking the Matterhorn as point of reference, the majestic bulk of which will accompany and guide the traveller along the entire route.